February 29 may be just another date on the calendar, but for a lot of people it has a huge meaning; it’s finally their actual birthday! Because technically, if you’re born on February 29, you really only have a birthday every four years. Now that could be a real bummer when you’re a kid, but think about it as you get older. For instance, you’re technically becoming a teenager when you’re 52 years old. For the ladies officially turning Sweet 16, you’re 64. And could we ever do a party for that one! Statistics indicate that there are approximately 187,000 people in the U.S. who were born on this day. Considering there are about 319 million people in the country, I’d say those leap year babies, who I’ve learned are generally called “leaplings,” are fairly rare. And that makes them pretty special! After all, the chances of being born on February 29 are 1 in 1,461. Of course being born on February 29 doesn’t really make them immune to aging like the rest of us. 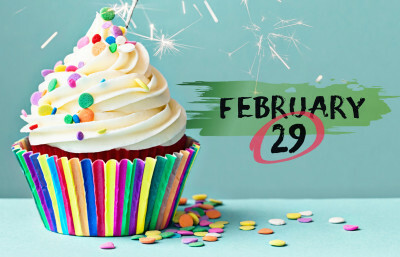 They just have to celebrate on the 28th or on March 1, which is usually the date most states recognize as a technical birthdate for anyone born on February 29. (Otherwise, you’d not be getting your driver’s license until you were in your 60’s, and that really wouldn’t be fair!) For leaplings that have children, unless their children are also born on February 29, their children will probably have had more actual birthdays than their parent by the time they’re 8 or 9 years old. How do you explain that one to a youngster? And how about the teacher who was born on February 29 and ends up having her students technically older than she is? Saying February 29 doesn’t even sound right, does it? All the other months have a 29th, but poor February only has one every 1,460 days! Maybe it should be some kind of special holiday. We would call it Leap Day. Personally I don’t know anyone who was born on February 29. At least I don’t think I do. But if you do, by all means, wish them a very Happy Birthday! They don’t always get to hear it every year!